The new HC Lokomotiv is ready to hit the ice, one year after the entire Yaroslavl team was lost in a devastating plane crash. One year ago, on September 7, 2011, Russian sport sustained one of the greatest losses in its history: a Yak-42 plane carrying the players, coaching staff and service personnel of Yaroslavl’s HC Lokomotiv crashed near the city of Yaroslavl shortly after takeoff. None of the 37 pro team members survived. HC Lokomotiv Yaroslavl was one of the most award-winning ice hockey clubs in the recent history of Russian sport. Founded in 1959, the club has changed its name several times. It was accepted in the top division of Russian ice hockey as HC Torpedo in 1987, and it acquired its current name in 2000, after the club was purchased by the Russian rail company RZD. The club won the Russian championships in 1997, 2002 and 2003, and nearly all the players killed in the crash had played for various national teams. The crash occurred at the very start of the Continental Hockey League (KHL) season, which typically starts in September. The executives of the club, having not been on the ill-fated plane, immediately announced their plans to restore the team. There were rumors that the club would continue to the championship, but these plans had to be given up, since the remaining juniors Lokomotiv players could not have put up a fight against such Russian hockey giants as Ak Bars, Avangard or Metallurg. Yet the year was not lost, as players from the junior team were selected for the future pro team, in addition to experienced players from other Russian clubs and foreign players from abroad. Alexei Kalyuzhny, Avangard Omsk captain and one of the most experienced and reputable players in the Russian Major League of the past few years, has also been invited to captain the new Lokomotiv team. The renewed Lokomotiv team that will participate in the 2012/2013 KHL season was ceremoniously presented to fans in Yaroslavl’s Ice Palace Arena 2000, earlier in September. The new players pledged to honor the jerseys in which the legendary club’s previous team had played. Shortly after the presentation of the new team took place, a memorial plaque was put up near Ice. Palace Arena 2000, in honor of the previous team as well. A monument to the team will also be erected within a year, after being postponed due to issues of complexity. 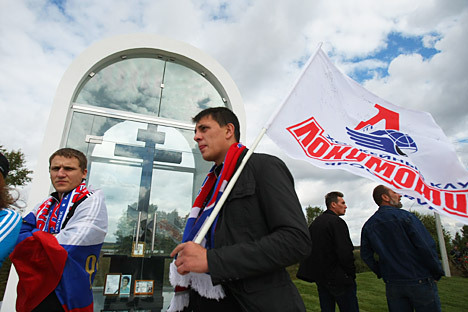 A memorial service was recently held on the anniversary of the accident, and memorials were unveiled at Leontyevskoe Cemetery and at the site of the tragedy. Tributes to the 2011 Lokomotiv team have not been limited to their hometown of Yaroslavl, either. In the distant city of Ekaterinburg, HC Avtomobilist has already erected a monument to Lokomotiv near its winter sports arena - fans there will now be welcomed by a near 7-foot-tall statue of a hockey player wearing a number 37 jersey, to honor the memory of the 37 players who died in last year’s crash. Furthermore, the first game of the season, traditionally played between the finalists of the previous season and originally called the Opening Cup, was this year renamed the Lokomotiv Cup. The new Lokomotiv team held its first game of the KHL season against HC Sibir from Novosibirsk, winning the match at 2:5. Lokomotiv then went on to defeat HC Amur from Khabarovsk with a 1:2 victory. The team faces a tough schedule in some of its September games to come, facing off against such powerhouses as Metallurg Novokuznetsk and Spartak Moscow. Still, hockey fans across Russia especially are no doubt cheering for Lokomotiv’s full recovery this season.